S.I.S. started to focus on supply chains several years ago with its premium quality bread wheat variety Bologna, which has been chosen by many milling companies as wellas producers of bakery products. Bologna is the main variety used by East Balt to produce Mc Donald’ssandwiches.In the last few years,Giorgione has become a leading variety along side Bologna. 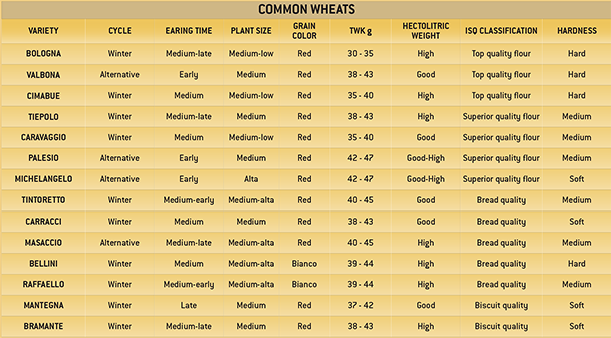 In addition to Bologna and Giorgione, the range of common wheat varietie soffered by S.I.S. also includes Mantegna (Biscuit quality)Antonello, Brunelleschi,Tiepolo and Palesio, whichis famous for its highly extensible flour (Top qualitybread wheats), Tintoretto,Guercino, Anapo and Anforeta (Standard qualitybread wheats), Bellini,Bernini and Angelico(Varieties with white grains). October Ears on harvesting 700 Inter-row 15-18 cm – depth 2-3 cm Seeds per hectare: 500 seeds/m2 Fertilising: with nitrogen (N kg/ha): 50-80 on heading plus 70-90 at the start of phosphorous germination (P2O5 kg/ha 70 in soil with a low potassium content (K2O kg/ha): 60 in soil with a low mineral content Weeds control: weeds control depends on the type of weeds, with pre-emergence treatments in the case of mainly graminaceous weeds and post-emergence treatment in the case of oat or mainly dicotyledons. Control against fungal diseases: use of industrially dressed seeds, measures against oidium septoria fusarium and rust in relation to specific variety resistances. Determined on the clean grain, with Schopper scales or similar instruments, or new automatic digital instruments. This is carried out using the I.C.C (International Association for Cereal science and Technology) method, which involves an indirect determination of the bread making value based on protein quality and quantity and particularly on gluten quality. 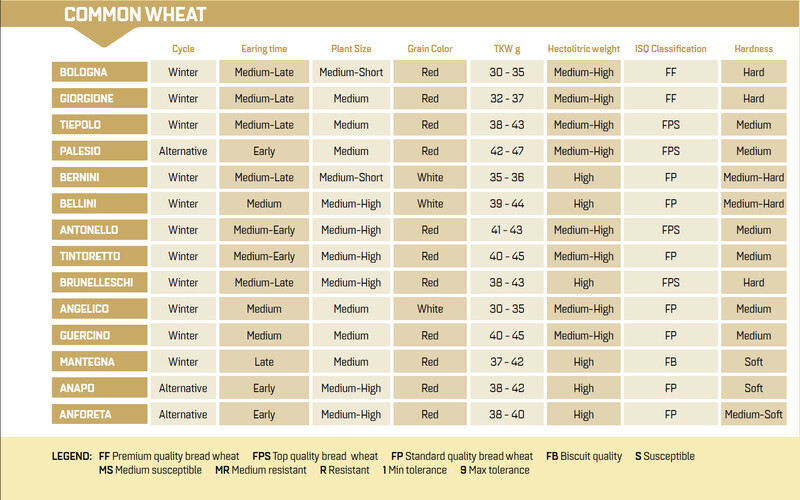 In general, values below 20 indicate a poor grain quality for bread making. This is determined on 7 g of flour using the Hagberg and Perten technique, and Falling Number 1600 equipment. The value is expressed in seconds and defines amylase activity which is particularly high in grains that are germinated or being germinated. Low falling values (below 160) indicate high amylase activity (a high quantity of alpha-amylase) and thus the risk that the dough mix may be particularly soft and sticky, affecting bread making. For normal bread making, optimal values are around 250.